One day, when Quentin Tarantino will shoot a remake of John Ford’s “The Searchers”, which will also be about a search party of righteous men, there will be a scene at a campfire out in the loneliness of the American prairie. The men are looking for the youngest daughter of a female left-wing African-American politician who was kidnapped by some KKK members to teach her a lesson. The area where they are is rather inaccessible, that’s why they have to use horses. The men had a hard and frustrating day, they do not know if they are on the right track and it’s been a while that they had left their beloved ones, so the mood is rather melancholy. Then the leader of the search party suggests that it would be great if someone could play some music but he guesses there were no instruments. Justin Haynes, one of the men, answers: “Well, actually I have a ukulele with me. I could play some songs.” “And I could use the little suitcase we found this morning as a drum kit,” Jean Martin, another member of the party, adds. “I have some bristles of a street sweeper. I could play on the edge of a table which would make a nice bass,” says another man called Ryan Driver. And then they start playing a crude way of swing, sometimes delightful, sometimes melancholic, and the others round the campfire fall in some kind of melancholia, smoking their cigarettes, longing for the good old days. 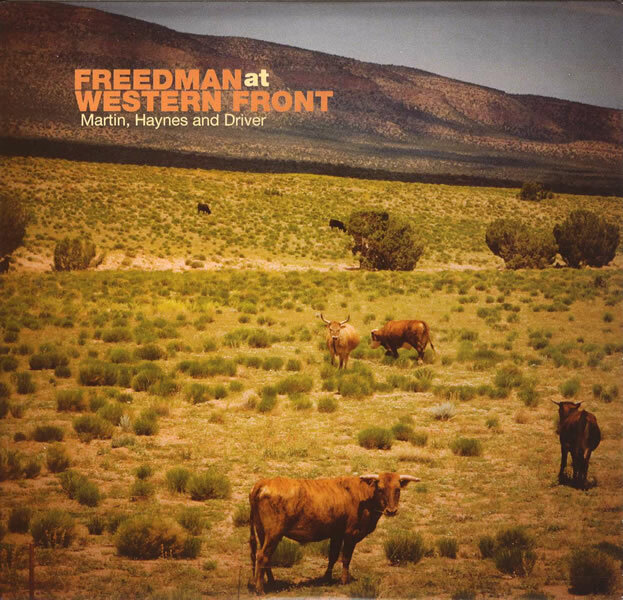 “Freedman at Western Front” is weird jazz music; however, the musicians are prominent figures of Toronto’s experimental music scene and they have chosen instruments that are deliberately makeshift which makes it possible to deconstruct the music. Thus, the trio exposes the bare skeleton of jazz and brings up new possibilities and provocations set upon them by the collective limitations of their tools. The band’s way of playing is relaxed and Haynes is a very skilled ukulele player. But the greatest surprise is Jean Martin, who articulates the notes so well with such a tiny piece of steel making it really sound like an upright bass. But he is not only trying to sound like an acoustic bass, he manages to create a lot of burpy, purring, and clanging noises you wouldn’t expect to come out of his instrument as well. 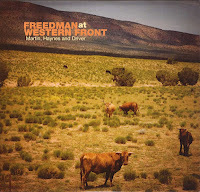 The trio plays the music of Myk Freedman, a jazz composer and lap-steel player for St. Dirt Elementary School (another project on Barnyard Records), and it is truly innovative. What makes this music so interesting is its immediacy, its banality and its minimalism. The album is fun to listen to but in the end the concept does not last for a complete record, the novelty factor loses its fascination after a while. The music is tighter when the trio sticks to strict song structures like in “The Gunk Under Pretty Pebbles”, “Hay” or “Plants and Animals”, when they lose the grip on the songs (“Clicking with the Clique”) it gets a bit pretentious. Nevertheless an interesting approach. You can buy it from the label barnyardrecords.com or download it from emusic.com.